I would like to be able to resize the Dock in macOS strictly using keybindings. Ideally, this would be incrementally and work similar to the way that volume/brightness increase/decrease keys work. I use BetterTouchTool for most of my gesture/shortcut customizations, and I have been able to achieve just about everything I've needed with it, but this is one thing I've yet to figure out. Has anyone ever successfully achieved this? If so, what was your approach (software, tools, etc.)? The approach I ended up taking was a variation of @Paolo's solution, and is simple to implement using a tool like BetterTouchTool (as @blizzrdof77 mentions in his original question). Instead of preparing two AppleScripts, this single script takes one argument - a numeric value between -1.5 and 1.5 - which determines whether the dock will increase or decrease in size. 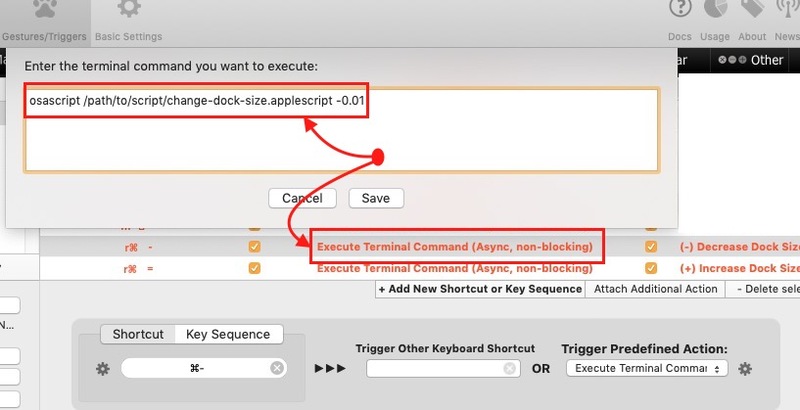 To use this in BTT, add two new shortcuts with the "Execute Terminal Command" action, and use the above examples as the commands (I've provided a screenshot of my setup below). I hope this helps! First you have to prepare two AppleScripts, one to increase the size of the Dock and one to decrease. You may run AppleScript Editor, write and test them. The dock size is a value ranging from 0 to 1. The above script increases / decreases the size by 0.05 steps. You may choose a different formula according to your needs. Do it twice: for the increase and decrease shortcut. When you create the services with Automator the AppleScripts run are the ones you prepared for increase/decrease the Dock size. How do I assign a keyboard shortcut to an AppleScript I wrote? so I did in the first version of this answer. However this approach involves restarting the Dock application with several drawbacks. As user3439894 suggested the Dock may be resized via AppleScript using System Events. This way the action takes place faster and more gracefully, so I updated my answer. Not the answer you're looking for? Browse other questions tagged macos dock shortcut keybindings customization .